Simple Text Counter is a free Windows 8 word counter app available under ‘Productivity’ section of its app store. This word counter app for Windows 8 lets you count the number of words and characters in a particular content. All you need to do is just enter the content or text in the Textbox and the result will display instantly. Well.. this word counter Windows 8 app is extremely beneficial for content writers like me or for those who make projects and are required to adhere to the limitations on the word count. Guys… you must use this application to count characters, letters, and words in your content. Let me quickly point out the main features of this Windows 8 word counter app below. Lets you count the number of words and characters in the content. Shows up the results instantly. Lets you easily copy content from anywhere and paste it in the given Textbox. Beneficial for content writers and for those who often make projects. I just loved this word counter app for Windows 8, its quick, shows precise results, can count words and characters, very simple to use. 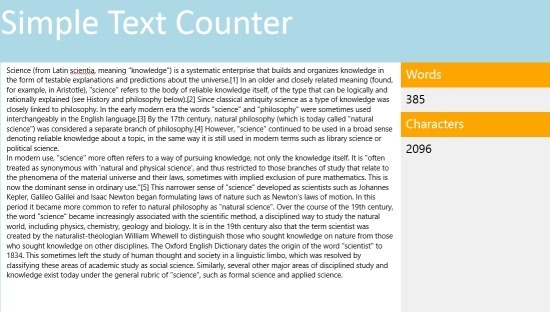 If you are concerned about the size of your articles you must download this Windows 8 word counter app. It’s very easy to download Simple Text Counter app in Windows 8. Also, check out our posts on PDF Reader Apps, Word Counter Apps, and Spelling Apps. Open this link in IE10 and click on ‘View in Windows Store’. You can now proceed with further installation steps. Soon, the app will be yours and you can instantly start using it. In short, Simple Text Counter is a good utility text counter app for Windows 8 which makes it very simple to adhere to the limitations on the word count of your articles or your projects. Go ahead and download Simple Text Counter app in Windows 8 now.